The blacklegged tick, I. scapularis, is the vector of Lyme disease, human anaplasmosis, babesiosis, and Powassan encephalitis. You can generally recognize an unengorged adult female blacklegged tick from its black legs and scutum (the area behind the head) and its orange to reddish body. It is about 1/10 inch long or generally smaller than the American dog tick (commonly referred to as wood tick), and it has long mouthparts. An adult male is about 1/16 inch long and dark brown. Adult males attach but do not feed. Nymphal deer ticks are a bit larger than a poppy seed and are dark and teardrop-shaped. Identifying ticks based solely on size and color is often challenging, especially when you encounter immature and/or ticks filled with blood. It is important to know what species of tick has bitten you as the American dog tick and other ticks are not known to transmit any diseases in Minnesota. If you ever have any doubt as to which tick you have encountered, contact a pest control expert for identification. 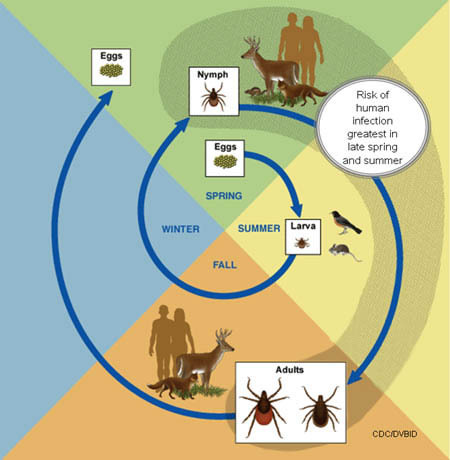 The life cycle of a blacklegged tick generally takes two to three years in Minnesota. Eggs are deposited by adult females during the spring, which hatch a month later into six-legged, pinhead-sized larvae. The larvae feed once on the blood of host animals, such as a white-footed mouse, during summer, taking about three to five days to complete their blood meal. 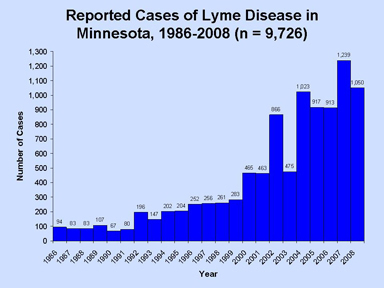 Lyme disease, human anaplasmosis, and babesiosis are not passed on to the larvae by infected adult females so they can only acquire any of these diseases by feeding on infected hosts. 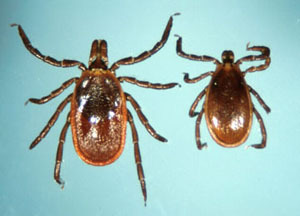 Powassan virus, however, can be passed from the female tick to her offspring, and are therefore a potential source of infection.. After feeding, larvae molt to eight-legged nymphs, the second immature stage, which overwinter until the following spring. During the late spring and early summer, these nymphs feed on host animals, staying attached for about three to five days. They also prefer white-footed mice, the primary source of disease infection, but will also feed on a variety of animals, including humans and dogs. Nymphs are very small, about the size of a poppy seed. The nymphs then molt into adults. Adult females feed either during the fall or the following spring, staying attached for about five to seven days when taking a blood meal. Adults are active outdoors even at temperatures as low as the mid to upper 30’so F but tend to be most active in warmer temperatures. A blacklegged tick can only transmit disease to humans through a bite. They cannot do so by just crawling on a person. Even when biting, a blacklegged tick must stay attached for at least 12-24 hours (in the case of human anaplasmosis) or at least 24-48 hours (in the case of Lyme disease) before it is able to transmit disease.. Only nymphal and adult female blacklegged ticks transmit these diseases. The exception to this rule is Powassan virus which can be transmitted all tick stages (larvae, nymphs and adults) within minutes following tick attachment. 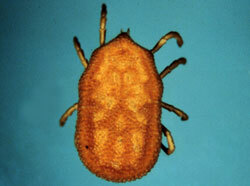 Occasionally, people may encounter soft ticks (fig. 2) which have a more leathery body and lack a scutum behind the head. When looking at a soft tick from above, the head is typically hidden from view. In homes, soft ticks are usually associated with bats. 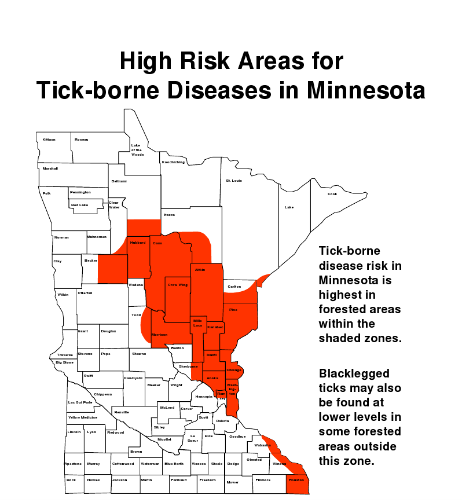 Minnesota provides suitable habitat for several tick species. Ticks can be very challenging to identify. 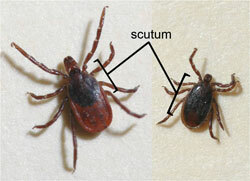 Color is sometimes helpful in distinguishing tick species but you can not rely on this in all situations. While there are differences in size between ticks, size is also not a reliable method as there is much overlap between species, especially when immature and adult ticks are encountered. Also remember that adult males are smaller compared to females. 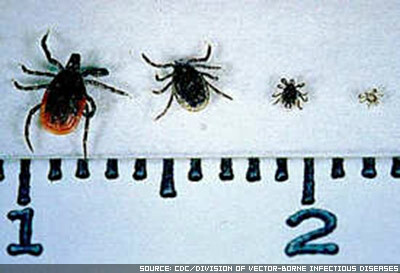 Engorged ticks are particularly challenging to identify as their size and color are greatly altered. You can distinguish between females and males in the adult stage as females possess a relatively small scutum while this plate-like structure in males covers most of their body (fig. 1). If there is ever any doubt as to what species of tick you have encountered, contact an expert for identification. Living in habitats of ticks can mean a higher chance of these pests. 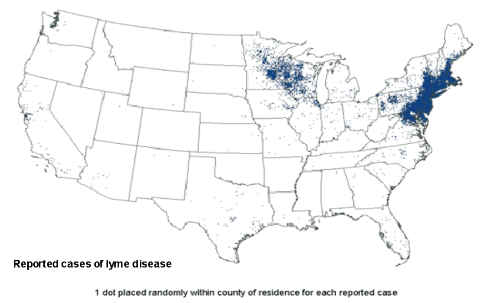 If you live in this type of area, or are noticing an increase in the amount of ticks in your area, it is wise to contact a professional pest control expert.